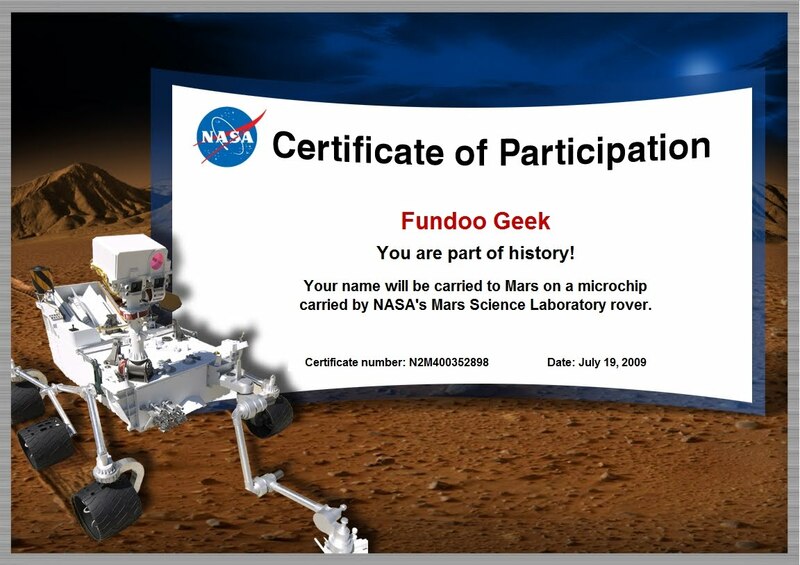 Head To Mars In NASA’s Mars Rover | the Fundoo Geek! Do you want to be part of NASA's historical Mars mission? This is truly your opportunity to go to Mars. Well, not physical you, but atleast you can have your name inscribed for eternity. NASA is giving you a chance to take your name to Mars in their next Mars Rover expedition and forever be part of history. All you have to do is visit this page and enter your name and country. Your name will then be stored in a microchip and placed in Mars Science Laboratory (MSL) Rover heading to Mars in 2011. Once you submit your name, you will get a certificate of your participation like the one on the right given to theFundooGeek! The MSL Rover is scheduled to be launched in the fall of 2011 and will study whether the planet can support microbial life. As this mission develops, more unique ways to participate will be added, especially when the rover gets to Mars! So what are you waiting for? Get going and participate before the blast off by clicking here. Cruise here for the MSL Mission details.